Key difference: Environment is the surrounding, which changes accordingly, while ecosystem involves the interaction between the environment and the organisms living in it. Environment relates to the surrounding in which living-organisms dwell. It is an area where living organisms reside. 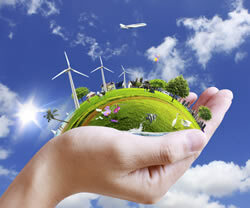 Earth is a form of environment, which comprises the components like water, air, living beings, non-living beings, etc. The environment acts as a surrounding for one to live in. It keeps on changing according to the surrounding elements. It defines the existence of an element in an area. It provides a place to dwell. An environment in the real sense is the surrounding around us, where we feel, see, and perform our daily task. Ecosystem is the community, where the living-organism lives in an area and interacts with the other elements of the environment. It consists of biotic and abiotic components. It provides a system for living organisms to dwell and manage its life with the surrounding. Ecosystem is the interaction between the environment and the components. It comprises of components like plants, animals, living-beings, and micro-organisms. It maintains the equilibrium between these components and environment. It is responsible for obtaining the stability in the environment. There are many ecosystems which deal with various organisms and their habitats. It provides the circumstances for any living-organism to live along with other factors. The activities, such as, to provide food in the natural form, to maintain the temperature in the environment, to balance the seasonal changes, etc. are managed by the ecosystem. In the ecosystem, every element has its own role, which is responsible for taking part in the interaction between the other elements. An environment is a surrounding, in which living organisms dwell. 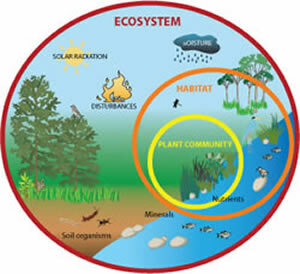 An ecosystem is a community of biotic and aboitic elements. It provides a place for elements. It provides an interaction between the elements. It consists of the physical environment provided by man. It involves the biological conversions. It provides the condition to live. It provides the relation between the components to live. Environment is a type of ecosystem. It includes the area to dwell. It includes the processes of life and surrounding.